I guess what doesn't kill you will make you stronger, and after the week that the County Line Rivals went through I am sure this statement is true. With a tri-meet in Limon on Thursday night and then following it up on Saturday for the Miner's Wrestling Tournament in Trinidad. This time of the year not only the weight factor comes in to play, but let's throw in flu season. The Tri-Meet was a kickoff to the weekend with Kiowa and Limon and although not many matches were wrestled it was good to see some of the Rivals get in a win. Saturday was an early 3:45 a.m. start - that's right I said a.m. - to get to their destination for weigh-ins and wrestling lasted throughout the day. As for the competition, it was tough! Nineteen teams gathered, and wrestling started at 9:00 a.m.
Let's begin with some outcomes from Limon. The Rivals posted 6 wins and 3 losses. Sam Adams suffered a loss by pin at the hands of Richardo Vidales from Kiowa in 1:47. Jonathan Burbank tallied up two wins for the night with a pin over Pennington from Kiowa in 5:09; and a major decision over Ricardo Vidales from Kiowa, 15-2. Cade Zordel lost by fall to Limon's Woody Aguilar in 1:11 but came back and pinned CJ Caton from Limon in 1:37. Tate Krentz took a tough loss to Kellen Kappel from Limon with a major decision, 13-4; but also came back strong and pinned Keeler Sparks from Kiowa in 3:24. Sam Wollert went one/one with a decision win, 9-3, over Gaige Hilferty from Limon and a fall to Jaron Carpenter from Limon in 1:24. Big guy Jaime Ibarra, only had a few seconds on the mat as he pinned Kriss Rice from Limon in 0:48. The rest of the squad did not get in a match. 106-pounds: Tate Krentz lost by fall to Michael Romero from Swink in 1:54 and lost by pin to Isaac Hutchings from Buena Visa in 4:30. Krentz was unable to place. 126-pounds: Samuel Adams also started out with a Swink wrestler, Matthew Mendoza which Adams was called pinned in 1:13. His 2nd opponent, Soto-Vargas from Dolores Huerta went down in 4:37. Adams' last match was a hard -fought contest against Leon Lujan from Las Vegas Robertson (New Mexico). Adams was pinned in 4:26. Adams did not place. 132-pounds: Jonathan Burbank got number one seed, Brett Benavides, right off the bat. It was a tech fall in Benavides' favor, 17-1. Chris Ryan from Trinidad didn't last long against the Rival and was flat in 1:24. Burbank was eliminated from tournament action losing to Ruben Vargas from Dumas by major decision, 10-1. 138-pounds: Sam Wollert filled this weight and had a nice 11-5 decision win over Ethan Stephens from Boys Ranch. He then faced Gilbert Falcon from Dumas and lost by fall in 0:44. Wollert came up against Anthony Balderas from Del Norte and was knocked out of the tournament with a close, 6-5 decision. 145-pounds: Cade Zordel was also put up against number one seed in his bracket, Jonathan Trujillo from Las Vegas Robertson. Zordel went down in 0:27. Zordel then faced Tristan Diamond from Salida and lost by fall in 1:46. Zordel was unable to place in the tournament. 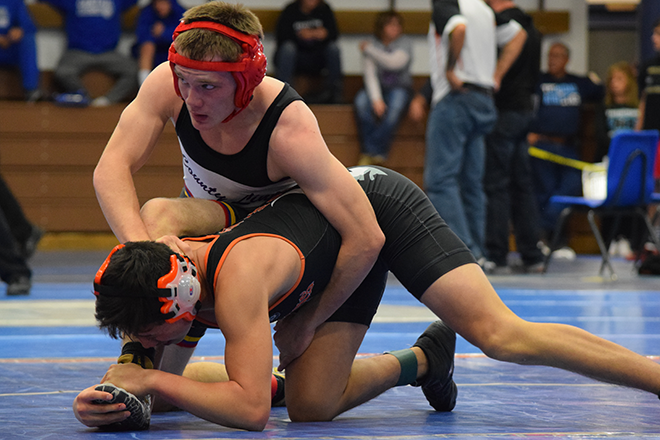 160-pounds: Trevor Randel battled it to the championship match with a pin over Jade Fenhaus from Boys Ranch in 2:32; a major decision win, 16-3, over Jayden Gomez from Centauri; and an 8-5 decision win over Adam Schultz from Crowley County. The championship match had Randel face-to-face with number one seed, Tristan Trujillo, a senior from Las Vegas Robertson. Trujillo stopped Randel in his tracks and got the major decision win, 12-0. Randel was the 2nd place finisher for the day in the 160-pound weight bracket. 170-pounds: A.J. Wilk came across Estevan Valerio from Taos, New Mexico. Valerio dropped Wilk into the consolation side of the bracket with a major decision, 11-2. Wilk's elimination match was a close neck-and-neck battle with Wilk having Seth Damgaard from Fowler on his back most of the 2nd period but the Grizzly came back in the 3rd and pinned Wilk in 4:46. Wilk did not place. 182-pounds: Dawson Roesch fought his way to the quarters with a first period pin over Gilbert Rodriquez from Pueblo Central in 1:53 and an 8-3 decision over Diego Falcon from Dumas. Roesch then hit a road block and went down to Jesse Camp from Salida, 6-1. First match in the consolation bracket was with Weston Huffaker from Centauri and although evenly matched, the Centauri wrestler pull off the squeaker, 1-0. Roesch then wrestled for 5th/6th against Clayton Demas from Taos. Demas came to the match limping, but he tried to wrestle but at the three-minute mark he decided enough was enough and Roesch received the forfeit. Roesch was the 5th place finisher in the 182-pound weight bracket. 182-pounds unattached: Jaime Ibarra is still working his way down a weight-class, so he was a light 182-pounder. Ibarra suffered a loss by fall to Jonathon Sarbacher from Salida in 1:36. The Rival fought off Eric Duran from West Las Vegas, and Tristen Vega from Boys Ranch with pins in 1:34 and 0:54 respectively. He was dropped out of the tournament with a 7-0 decision loss to Weston Huffaker from Centauri. 195-pounds: Ken Cox kicked off his bracket with a 3:58 pin over Brian Moraga from Taos. In the quarters Cox was shaking hands to begin the match with Dahlton McGhee from Fowler. The Grizzly kept Cox from getting too much done and it was the Rival headed to the consolations, 7-1. With a nice 2:07 pin over Dylan Navarrette from Dumas, Cox was wrestling for 3rd/4th place. Cox was on a mission and ended the day with a 2:26 pin over Damen Garcia from Boys Ranch. This Rival finished the day with a 3rd place medal. 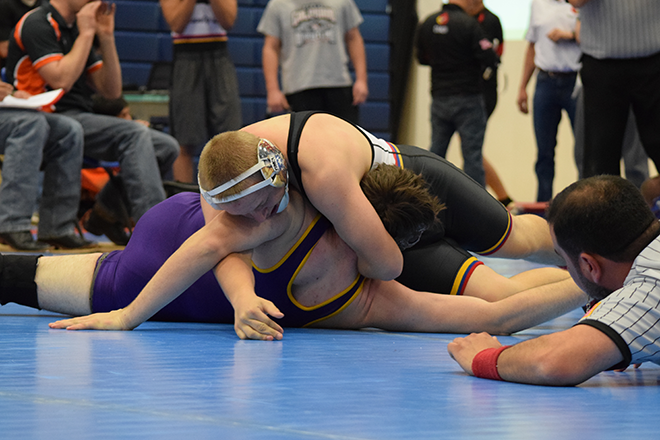 220-pounds: Jayce Bauer had a heart-breaking first match with a loss by decision to Chris Delatorre from Dumas, 5-3. Bauer, not wanting to come home empty handed, pinned James Mendoza from Sierra Grande in 2:33 and had his hand raised after six-minutes with a 6-5 decision over Caleb Armijo from Trinidad. As luck would have it he then got another go with Delatorre from Dumas. This match the Rival had him pinned in 3:39. Bauer hit a brick wall against Austin Thornton from Dumas and suffered a major decision 8-0 loss. 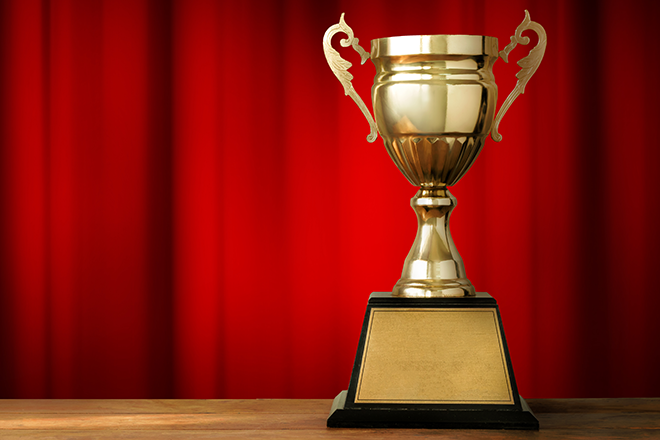 Bauer was able to make the award stands in the 4th place position. Dumas ran away with the tournament scoring 263.5 points, but the County Line Rivals were able to score 78 points which was good enough to finish in 7th place out of 19 teams. The only 2A team to beat them was Fowler with 94 points. Hopefully everyone will be healthy and ready to wrestle in Stratton this coming Saturday, January 27, 2018. With Crowley County the only tournament left after Stratton it is time for all wrestlers to be comfortable with their weights to be prepared to go into the Regional Tournament the following weekend to be held in Sanford. Also, it would be nice to see Fowler and Michael back on the mat as soon as possible. Go Rivals!! Photos courtesy Rhonda Uhland. Top: Jonathan Burbank needs to get his leg free to be awarded points in his match against Ruben Vargas from Dumas. Bottom: A.J. Wilk pushes Seth Damgaard from Fowler to the mat for back points during action on Saturday in Trinidad.